One of the most striking features of the Cathedral interior is the pulpitum screen dividing the nave from the quire. This stone screen is beatuifully carved, with niches holding statues of saints. The screen was completed around 1450. In the 14th century Lanfranc's Romanesque nave was rebuilt in the then fashionable Perpendicular Gothic style. It was built to a design by the royal master mason, Henry Yevele. The most immediately striking feature of the nave is the sense of height due to the slender columns which rise up to form vaulted arches above your head. These vaulting ribs meet in a series of gilded roof bosses. The Norman quire was destroyed by fire in 1174. It was rebuilt and extended to form the existing quire. The most immediately striking aspect of the quire is the difference in style from the later Perpendicular style of the nave. Here, the lines are rounder and less exuberant. This is trhe oldest part of the existing church, dating to the 11th century. It is a extraordinary place; a veritable forest of thick, rounded, Romanesque columns rising to vaulting arches. Some of the column capitals are magnificently carved with Norman designs, including geometric patterns and fabulous beasts. About the outer edges of the Crypt are a series of small chapels. One of these, St Gabriel's Chapel, shows traces of very early wall paintings. This small area below the pulpitum screen is where Becket met his death. A [relatively] modern sculpture of two swords and a large, broken sword point are fixed to the wall above a small altar, called Altar of the Sword's Point. On the floor beside the altar is a simple memorial stone, upon which is inscribed simply the name 'Thomas'. Also in The Martyrdom is the oldest memorial in the cathedral, that of of Archbishop Peckham, who died in 1292. From the Martyrdom a door leads to the cloister. This is the site of the marriage between Edward I and Margaret of Anjou in 1299. The oldest stained glass in the cathedral is located in the lowest tier of the west window. This is a depiction of Adam digging, and dates to about 1176 AD. This small chapel was built onto the south transept. At the back of the chapel is the tomb of Archbishop Stephen Langton (1150-1228). Langton was origionally buerisd in open ground outside the church, but the chapel was built over his grave and the builders decided to leave him interred and simply construct a memorial over the grave site. Also within the chapel are several superbly decorated 15th and 16th century tombs. The cathedral interior is full of historic memorials. 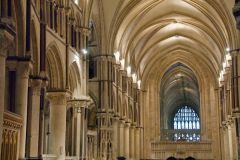 The most famous are located on either side of Trinity Chapel where the candle marks the site of Becket's shrine. On the south side is the tomb of Edward the Black Prince (d. 1276). Above the Black Prince's tomb are pieces of his armour. Further pieces of the prince's armour are mounted on a wall display a bit further down the south ambulatory. On the north side of the Trinity Chapel is the canopied tomb of Henry IV and his wife, Joan of Navarre. This tomb is beautifully crafted, one of the finest examples of 15th century work in the country. The north quire aisle has memorials to six archbishops, including Archbishop Simon Sudbury, murdered during the 1381 Peasant's Revolt, and the richly painted tomb of Archbishop Chicheley, who founded All Souls College, Oxford. 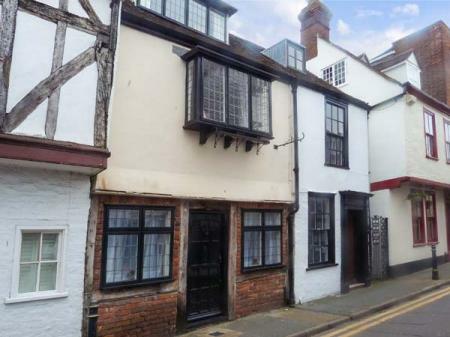 Don't miss the next article in this series, which looks at what to see in the Canterbury Cathedral precinct.